These 2016 works on Nippon Kaigi, however, were not the first. A number of journalists, scholars and activists have long paid attention to the history and activism of Nippon Kaigi. Tawara Yoshifumi, a leading specialist on education and textbook adoption issues, and the secretary general of Children and Textbooks Japan Network 21, has published articles and books that on Nippon Kaigi over the years. The article translated here appeared in the December 2016 volume of the magazine, Heiwa Undō (Peace Movement), and summarizes his most recent book Nippon Kaigi no Zenbō: Shirarezaru Kyodai Soshiki no Jittai [The Complete Picture of Nippon Kaigi: The Unknown Reality of an Mammoth Organization.] (Kadensha 2016.) In the book, Tawara utilized data on Nippon Kaigi accumulated over a long period of time to describe Nippon Kaigi’s history, organizational structure, “grassroots” movement style, and goals. 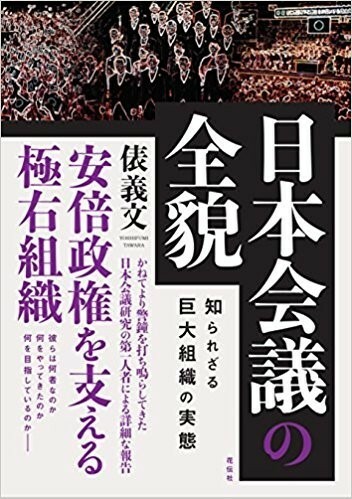 Tawara traces the history of the right-wing movement that led to the formation of Nippon Kaigi from the 1970s, starting with a movement to legalize imperial era names. The two organizations that played significant roles in this movement, namely, Nihon wo Mamoru Kokumin Kaigi [National Conference to Protect Japan] and Nihon wo Mamoru Kai [Association to Protect Japan], merged in 1997 to form Nippon Kaigi. Tawara points out that unlike these organizations, Nippon Kaigi appointed business leaders and intellectuals as board members and hid its right-wing priorities, but the nature of the organization remained unchanged. Tawara then introduces various affiliated organizations of Nippon Kaigi, such as its Diet Members’ League and Local Assembly Members’ League, its women’s section called Japan Women’s Association, and Nihon Seinen Kyōgikai [Japan Youth Council]. Nippon Kaigi has various front organizations for independent issues, such as the Utsukushii Nippon no Kenpō wo Tsukuru Kokumin no Kai [National Citizens’ Association to Create a Beautiful Constitution for Japan] promoting constitutional reform. Mobilizing local branches and various affiliated organizations across Japan in national and local levels, Tawara shows, Nippon Kaigi operates a “grassroots right-wing movement,” while maintaining strong ties with the Abe administration. Tawara emphasizes that Nippon Kaigi presents the Constitution, education, and defense as a set of interlocking issues, an approach shared with Prime Minister Abe’s policy priorities. Tawara particularly focuses on two issues: education and the Constitutional amendment. Tawara’s greatest contribution centers on education, reflecting his long-term commitment to issues of education and textbooks, from Ienaga Saburō’s textbook trials beginning in 1965 to the present. Tawara shows how the Abe administration’s concept of Kyōiku Saisei [education rebuilding] seeks to overturn the foundations of contemporary education. The 2006 revision of the Fundamental Law of Education, which defined the goal of education not to serve students but the state by emphasizing patriotic education, was a major victory of the first Abe administration (2006-7). This had a tremendous impact on the direction of education – not simply in schools but also in communities and even in families (the revised Law includes an article on “family education”.) Abe’s modification of the Board of Education system in 2014 made it much easier for governors and mayors to intervene in education and the textbook adoption process. Under this new system, Tawara notes, members of the Nippon Kaigi Local Assembly Members League have played significant roles in promoting a conservative and revisionist history and civic textbooks published by Ikuhōsha (connected with the Japan Education Rebuilding Organization) and Jiyūsha (connected with the Society for History Textbook Reform). Moreover, under the second Abe administration, “moral education” (dōtoku) was introduced as an “official subject” (i.e., with grades assigned, based on evaluation of degree of patriotism among other rubrics) in elementary and junior high schools, which has been criticized for potentially interfering with children’s freedom of thought. As of September 2017, the adoption process of elementary school moral education textbooks to be used from 2018 is under way. The textbook published by Kyōiku Shuppan includes members of the Japan Education Rebuilding Organization among its editors, and has an especially patriotic content, with photos of conservative politicians, including Abe Shinzo, in the text.3 In the translated text, Tawara stresses the danger of the next Gakushū Shidō Yoryō [Education Guideline], which fundamentally changes the guidelines for all aspects of schools, families and communities. Tawara insists that the aim of education became two-fold in the new guideline: to strengthen “human resources” for the sake of the state by promoting patriotism, and also in the service of large corporations by promoting neoliberal policies. Currently the most important goal for Nippon Kaigi is undoubtedly to amend the post-war Constitution. Nippon Kaigi founded the National Citizens’ Association to Create a Beautiful Constitution for Japan in 2014, to promote a constitutional revision movement based on a “national referendum” to be held during Abe’s administration. The organization has actively pursued approaches introduced in the 1970s to pass legislation that requires the use of imperial era names, ranging from a massive “10 million” signature drive, collecting petitions from local assemblies, holding gatherings in such major venues as Nippon Budōkan of Tokyo, conducting small study group meetings across Japan, distributing leaflets and a DVD, and broadcasting videos on YouTube. It is important to note that while there is no doubt that amendment of Article 9 receives the greatest attention, Nippon Kaigi calls for seven important constitutional revisions including the making of a new clause on emergency powers and the addition of a family protection clause to Article 24.5 On May 3, 2017, Prime Minister Abe delivered a video message at a symposium held by the National Citizens’ Association. There, he called for making “explicit the status” of the self-defense forces in Article 9 of the Constitution by the year 2020. Clearly, Article 9 has become a priority for Nippon Kaigi. On August 15 this year, I visited the booth of the National Citizens’ Association to Create a Beautiful Constitution for Japan at a street near Yasukune Shrine. 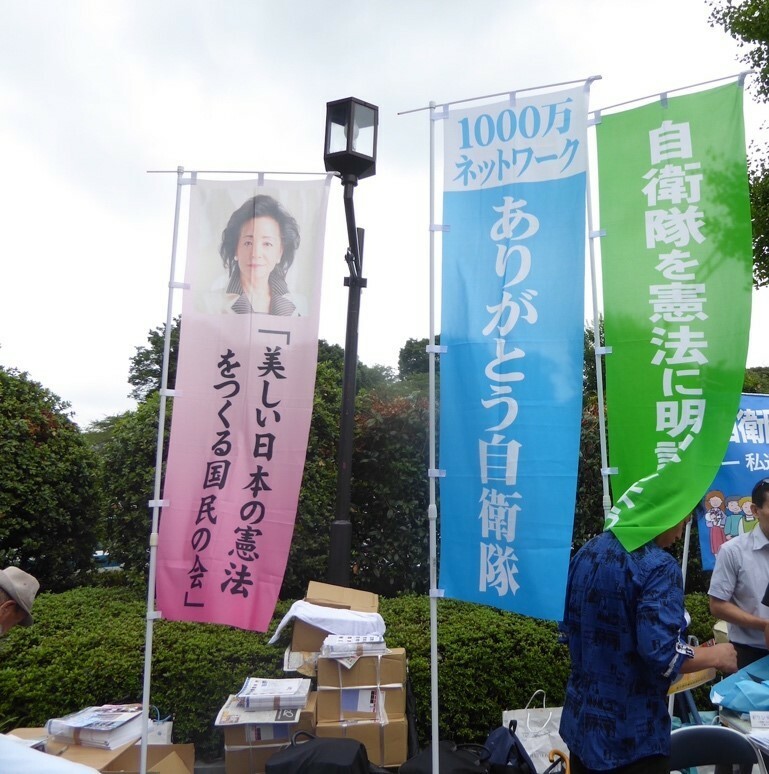 There flags and signs included “Write the SDF into the Constitution” and “Thank you, SDF,” along with a photo of journalist Sakurai Yoshiko, who is also one of the co-chairs of the National Citizens’ Association. I also received a flyer “Thank you, SDF.” Despite heavy rain, Nippon Kaigi was holding a gathering in a tent on the grounds of the shrine. The main speaker was LDP Upper House representative and former SDF member Sato Masahisa discussing the importance of the SDF and the need to revise the Constitution. It was obvious that the goal of amending the Constitution by 2020, by writing the SDF into Article 9 of the Constitution, remains a Nippon Kaigi priority as it is of the Abe administration. The flags at the booth of the Association to Create a Beautiful Constitution for Japan in front of Yasukuni Shrine on August 15, 2017. 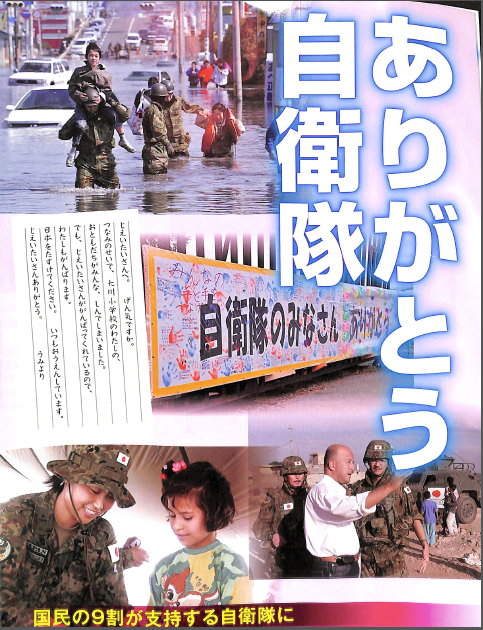 The flyer “Thank you, SDF” by the National Citizens’ Association to Create a Beautiful Constitution for Japan. On September 28, Prime Minister Abe Shinzo dissolved the lower house of the parliament, and a snap election was held on October 22. Abe’s LDP and its coalition partners secured a major victory, with more than half of the seats won by the LDP. As the LDP and the Komeito Party that currently form a coalition government, gained two-third of the Lower House, which is the number of votes needed to assure a national referendum for constitutional revision, the likelihood is that a proposal to hold a national referendum will be submitted to the Diet in the very near future. Under Japan’s national referendum law, a majority (more than 50%) vote is required to amend the Constitution, with no stipulation as to the minimum number of votes cast. Since 2014, with its “10 million signature campaign,” the priority for Nippon Kaigi has been holding a successful national referendum to amend the constitution. The new Kibō no Tō (Party of Hope) led by Tokyo governor Koike Yuriko was formed immediately before the election, absorbing a significant number of candidates from the then-biggest opposition party, the Democratic Party of Japan. Koike, a former LDP representative, was once the vice president of the Nippon Kaigi’s Diet Members’ League. Like Abe, she supports constitutional revision, and in a press conferenceheld on September 22, she indicated her commitment to constitutional revision efforts, and encouraged further discussion of the issue in her new party. In 2003, Koike stated in Voice magazine that she considers it possible for Japan to arm itself with nuclear weapons. Journalist Aoki Osamu reports that Koike may not have a very close relationship with Nippon Kaigi compared to other conservative politicians at this moment, but it is entirely possible that she may become closer to Nippon Kaigi in future.6 Breaking with the practice of previous Tokyo governors, including conservative Ishihara Shintarō, Koike declined to send eulogies to the commemoration of Korean victims massacred at the time of the Great Kanto Earthquake in 1923, which also suggests her historical revisionist stance.7 Akahata reported on September 28 that six members of the Party of Hope belong to the Nippon Kaigi Diet Members’ League. The Party of Hope struggled in the election, failing to become the main opposition party, while the LDP scored a landslide victory. On the other hand, a newly established Rikken Minshu-tō [Constitutional Democratic Party] led by Edano Yukio, former DPJ politician who did not join the Party of Hope, won 55 seats, and became the second biggest party in the Lower House after the LDP. The party’s platform included opposition to the revision of the Article 9, the Constitution’s peace clause. What is the Aim of Nippon Kaigi, The Ultra-Right Organization that is a Pillar of Japan’s Abe Administration? What is Japan’s largest ultra-right organization, Nippon Kaigi, whose slogan is “Build a nation with pride”? On its official website, Nippon Kaigi explains: “We, the Nippon Kaigi, are a civic group that presents policy proposals and promotes a national movement for restoring a beautiful Japan and building a proud nation.” Nippon Kaigi is a national movement organization with a nationwide grassroots network that was established on May 30, 1997 by the merger of Nihon wo Mamoru Kokumin Kaigi [National Conference to Protect Japan] and Nihon wo Mamoru Kai [Association to Protect Japan]. We will briefly look at these two organizations. The Nihon wo Mamoru Kai was a religious-affiliated rightwing organization formed in April 1974 as a Shintō and Buddhist-affiliated religious group by the (then) chief abbot, Asahina Sōgen, of Kamakura’s Enkakuji Temple. The central religious association at the time of its founding was Seichō-no-Ie [House of Growth]. In July 1978, springing from the Nihon wo Mamoru Kai, the Gengō Hōseika Jitsugen Kokumin Kaigi [National Conference to Establish Reign Era Name Use as Law] Legislate Era Names (chaired by the late Ishida Kazuto, a former Supreme Court judge) was formed.8 Centered on this organization, a “national movement” [kokumin undō] was launched, and on June 6, 1979, the Diet passed a bill on era names, making the practice into law. At its launch, its officials included Chairman Kase Shunji (Japan’s first ambassador to the United Nations; now deceased), Steering Committee Chairman Mayuzumi Toshirō (musician, later chairman of Kokumin Kaigi; deceased), Secretary General Soejima Hiroyuki (permanent consultant to Meiji Shrine, former senior member of the Nippon Kaigi; deceased), Executive Secretary Kabashima Yūzō (currently Executive Secretary of Nippon Kaigi). The first issue of Kokumin Kaigi’s official organ Nihon no Ibuki [Japan’s Breath of Energy] was issued on April 15, 1984. It was not a monthly publication then, and prior to the launching of Nippon Kaigi, about 113 issues had been published. Even after it became the official organ of Nippon Kaigi, it continued to be published with the same name, and labeled, “an opinion magazine aiming at building a country that has pride” (As of Nov. 2016, the total number of issuespublished is 348). nation state or, in other words, how we perceive the role of the Emperor. In October 1982, Kokumin Kaigi held a “Conference to Consider the Textbook Problem,” and proposed an independent textbook. Then, in December 1983, by consolidating rightwing forces, the “National Conference to Normalize Textbooks” was established, and the organization began to write a history textbook. It was Kokumin Kaigi that worked on the task. At the plenary meeting of the Kokumin Kaigi, Secretary General Soejima Hiroyuki (now deceased, but at the time, permanent consultant to Meiji Shrine), who had proposed a “Basic Policy for a National Movement in Showa 59 (1984),” stated: “In tackling such tasks as publishing a textbook, I would like to lay the ideological groundwork for constitutional revision” (Nihon no Ibuki, #2, July 15, 1984). In this way, Kokumin Kaigi positioned the publishing of a high-school history textbook as “forming an ideal flow” toward meeting the goal of amending the Constitution in order to create a national polity centered on the Emperor. Moreover, placing the Constitution, defense, and education on the agenda, Kokumin Kaigi considered it necessary to publish a high school Japanese history textbook that would nurture a national consciousness or patriotism. The association issued an officially approved textbook that passed the Ministry of Education’s screening, Shinpen Nihon Shi [New Edition of Japanese History] (Hara Shobō, now published by Meiseisha as Saishin Nihon Shi [Most Recent Japanese History]), in commemoration of the 60th year of the reign of the Showa Emperor. After that, Kokumin Kaigi, while making constitutional revision its central goal, developed other tactics, such as education and the textbook issue, a movement to justify Japan’s war of aggression and its atrocities, a movement to respect and love the Imperial Household, a movement to denounce the displays of peace materials in halls set up by local authorities across the country. At this time, Kokumin Kaigi strengthened its ties with rightwing Diet members in the LDP and other parties, becoming the central organization of the rightwing movement. Mergers Lead to Birth of Nippon Kaigi: Business executives became officials. On May 30, 1997, Kokumin Kaigi merged with the Nihon wo Mamoru Kai to launch Nippon Kaigi as an organization dedicated to amending the Constitution and to promoting Imperial rule. Looking at Kokumin Kaigi’s officials and members, most people could conclude that it was a rightwing organization, but after it became Nippon Kaigi, it hid its rightwing nature by appointing as officials, others such as business executives, university professors, and intellectuals. However, its true nature did not change. Among the first generation of chairmen of the Kokumin Kaigi was the late Tsukamoto Kōichi (then chairman of an intimate apparel company, Wacoal). He was succeeded as the second chairman (June 2000-December 2001) by Inaba Kōsaku (now deceased), who was then head of the Japan Chamber of Commerce and Industry. Former Supreme Court justice Miyoshi Tōru became the third chairman in December 2001, and on April 16, 2015, Takubo Tadae, a former journalist and college professor, was appointed the fourth chairman, with Miyoshi becoming the honorary chair. The executive secretary is now Kabashima Yūzō (chairman of Nihon Kyōgikai [Japan Council] and Nihon Seinen Kyōgikai[Japan Youth Council]), who was the executive secretary of both organizations when they merged in 1997. The vice chairs are Anzai Aiko (musician), Odamura Shirō (former president of Takushoku University, representative of worshippers at Yasukuni Shrine), Kobori Keiichirō (professor emeritus at Tokyo University), Tanaka Tsunekiyo (president of Jinja Honchō [Association of Shinto Shrines]). The director is Amitani Michihiro (chief priest at Meiji Jingū and head of the association of worshippers at Meiji Jingū). The executive director is Matsumura Toshiaki (executive director of Nippon Kaigi). Those listed as consultants are Ishii Kōichirō (president of Bridgestone Bicycle), Kitashirakawa Michihisa (executive director of Jinja Honchō), Takatsukasa Naotake (head of Ise Shrine). Among those named above, five of the 12 officers are connected to religious organizations, and five are officials of rightwing organizations, such as Kaikōsha and Eirei ni Kotaeru Kai [the Association to Respect Deceased Soldiers (at Yasukuni Shrine). Of the 40 representative committee members, 16 are associated with religious organizations, such as the head priest at Yasukuni Shrine (as of July 1, 2016). In order to conduct research on a new Constitution and promote the revision of the current Constitution, Nippon Kaigi took over Shin Kenpō Kenkyū Kai [New Constitution Study Group] (headed by Vice Chairman Odamura Shirō), which Kokumin Kaigi had established in June 1995. And in June 1997, it established “the Seisaku Kenkyūkai [Policy Committee] to Consider the Current Situation and Policy Agenda” (headed by then Executive Director Ōhara Yasuo). In January 1999, Nippon Kaigi launched the Kokusai Kōhō Iinkai [International Public Relations Committee’ For Broadcasting Japan’s New Image to the World] (chaired by the committee member, Takemoto Tadao), and in March, it established the “Nihon Kyōiku Kaigi [the Japan Educational Conference] for Promoting Educational Reforms” (chaired by Adviser Ishii Koichirō, with Takahashi Shirō (currently a board member of the Japan Education Rebuilding Organization [Nihon Kyoiku Saisei Kikō] as principal investigator. On May 29, 1997, the day before Nippon Kaigi was launched, the LDP’s Obuchi Keizō and Mori Yoshirō (both of whom later became prime ministers), together with then Shinshintō [New Frontier Party] member Ozawa Tatsuo, formed a non-partisan Round Table Conference of Diet Members of Nippon Kaigi (a.k.a. Nippon Kaigi Diet Members League), with the aim of fully backing and linking to Nippon Kaigi. After it was launched, Nippon Kaigi was closely aligned with these Diet Members and promoted various maneuvers behind the scenes, such as efforts to revise the Constitution and the Basic Education Law. The group also promoted the adoption of a textbook that distorted Japanese history. In order to Support the Japanese Society for History Textbook Reform [Atarashii Rekishi Kyōkasho wo Tsukurukai] that predated the Nippon Kaigi Diet Members League, in February 1997, Nippon no Zento to Rekishi Kyōiku wo Kangaeru Wakate Giin no Kai [The Young Diet Members For Japan’s Future and History Education (a.k.a. Textbook Parliamentarians’ League) was launched centered on Nakagawa Shōichi (now deceased), Abe Shinzō, and Etō Seiichi. In February 2004, the word “young” was removed from the association, and it had an extremely close relationship with the Nippon Kaigi Diet Members League. At its launch, the Nippon Kaigi Diet Members League had 189 members from both chambers. The number continued to increase, and as of November 2015, there were 281 members (mostly LDP), and the members of the Nippon Kaigi Diet Members League were the largest force in both houses with around 40 percent of the 717 Diet members. This rightwing league was behind the launching of the three Abe cabinets. Abe was the League’s key person as party president and prime minister. In the 3rd Abe Cabinet, 16 out of the 20 (80 percent) of the ministers are members of the Nippon Kaigi Diet Members League. The Nippon Kaigi, with its close ties to the Diet Members League, is now running Japanese politics. 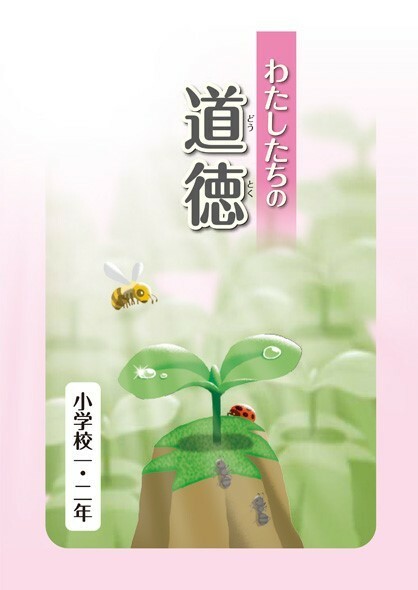 One example can be seen in the Ministry of Education, Culture, Sports, Science and Technology (MEXT), which from 2002 has distributed, to all elementary and middle-school children, supplemental educational pamphlets called Kokoro no Nōto [Notes for the Heart] (four levels: 1st and 2nd graders, 3rd and 4th graders, 5th and 6th graders, and middle-school use). The materials promote official moral values, starting with love of country, and are aimed at controlling the minds of children. Nippon Kaigi proposed that such materials be drafted and disseminated, and in March 2000, Upper House member Kamei Ikuo (now deceased), a Nippon Kaigi Diet Members League member, brought the subject up in the Diet. Then Education Minister Nakasone Hirofumi, also a League member, replied that he would consider the proposal, and almost immediately, it was budgeted. A week later, then Parliamentary Vice-Minister of Education Kawamura Takeo, another League member, replied in the Diet: “We will publish and distribute (the pamphlets) to schools across the nation.” In March 2001, at a general meeting on policies proposed, Nippon Kaigi touted the success of this one, stating, “Taking the opportunity of Diet interpellations on the House floor, the MEXT minister decided to draw up a moral educational material to be titled Notes for the Heart. A frightful precedent was created in which the request of a rightwing group was brought up in the Diet by lawmakers linked to it, and then was implemented as national policy. Our Moral Values for the first and second grade students of elementary schools. And for fiscal 2018, approved textbooks will be published, fully carrying out the new policy. Even for 2015, in order to promote the policy before it is put into effect and the textbook published, the Ministry ordered that Our Moral Values be used as a “textbook” and that it be used jointly with the approved textbooks after it came out. In addition, the author of the textbook Our Moral Values, Kaizuka Shigeki (professor at Musashino University, who is a member of MEXT’s round-table of promoting moral values as educational material, as well as a board member of the Japan Organization for Educational Reform) has been promoting the issuance of educational material on morality, asserting that the book Our Moral Values would become a model for approved textbooks. (For more detail, see Textbook 21’s booklet Sweeping Criticism! Children Being Warped by the Moral Education Textbook ‘Our Moral Values’, 2014. Sweeping Criticism! Children Being Warped by the Moral Education Textbook ‘Our Moral Values’, Gōdō Shuppan, 2014. In September 2001, Nippon Kaigi established as its organization for women, Nihon Jyosei no Kai [Japan Women’s Association] (then chaired by Anzai Aiko, who was vice chairperson of the Nippon Kaigi; the following chair was Onoda Machie. )11 What became the central campaign of this women’s association was the so-called “gender backlash,” that is, repeated attacks on such issues as gender equality measures, separate surnames for married couples, and gender equal education. Currently, Nippon Kaigi is making every effort to advance constitutional revision, which Prime Minister Abe has been promoting. Targeting a female audience, it has hosted “cafes” across the country, where “women get together to chat about the Constitution.” The Japan Women’s Association is taking up that challenge. In addition, the rightwing Nihon Seinen Kyōgikai [ Japan Youth Council], founded in 1970 by Etō Seiichi (now an assistant to Prime Minister Abe), Takahashi Shirō (board member of the Japan Education Rebuilding Organization), and former education committee chairman for Saitama Prefecture), Kabashima Yuzō, et al., has now become in effect Nippon Kaigi’s youth organization. This organization is carrying out secretariat activities for Nippon Kaigi; it is an “action squad” which carries out a “national caravan” campaign several times a year. Nippon Kaigi is the central organization of such activities as a round-table conference of intellectuals to “reform Japanese education” by promoting amendments to the Fundamental Law of Education (Private Ad Hoc Committee on Education, established in 2003 and chaired by Nishizawa Jun’ichi, as well as “Japan and the Constitution in the 21st Century”, a group that promotes revising the Constitution, a.k.a. Private Ad Hoc Committee on the Constitution, established in 2001 and then headed by Miura Shumon. ) This group has generated a “national movement” to amend the Constitution, and every March, it holds a rally, sponsored by the Private Ad Hoc Committee on the Constitution, to call for constitutional revision. On May 3, 2016, the Private Ad Hoc Committee on the Constitution, together with the Utsukushii Nippon no Kenpō wo Tsukuru Kokumin no Kai [National Association to Create a Beautiful Constitution for Japan” (Kokumin no Kai)], sponsored the 18th public forum on the Constitution, titled, “Calling for an Initiative to Realize Speedy Revision of the Constitution! We Propose that Each Political Party Hold Discussions on the Constitution to Respond to the Emergency Situation” (1,200 people attended according to the organizers). In a video message, Prime Minister Abe, who was then travelling abroad, exhorted the assembly: “Do not fall into a brain-dead state of not daring to even lay a finger on the Constitution or even avoid debating it. We will create with our own hands a constitution appropriate for the times. Let us unite to revise the Constitution.” The LDP President’s special assistant, Shimomura Hakubun, was present and asserted to the crowd: “There are many people who feel it is thanks to the presence of Article 9 in the Constitution, that Japan has not been drawn into war.” He cited as an example the Great East Japan Earthquake as a situation demanding an emergency provision in the Constitution: “Since the terms of Diet members are limited by the Constitution, we cannot legally make an exception. If an emergency situation occurs, the terms should be extended as a special case. No one would have any reason to oppose this” (as reported by Asahi Shimbun, May 4, 2016). Prime Minister Abe, his administration, and the LDP share this view. Moreover, in addition to Shimomura and Sakurai, also attending were Matsubara Jin (Democratic Party, Lower House member), Eguchi Katsuhiko (adviser to the Diet members’ group Initiatives from Osaka [Osaka Ishin no Kai]), Nakayama Kyoko (head of the Nihon no Kokoro wo Taisetsu ni suru Tō [The Party for the Japanese Kokoro]), Uchida Fumihiro (secretary general of the Kokumin no Kai), Hara Masao (former mayor of Koriyama City in Fukushima Prefecture), Nishi Osamu (professor emeritus of Komazawa University), Aoki Shōgo (vice chairman of the Junior Chamber International Japan), Yamamoto Mizuki (student, Faculty of Law, Keio University), and Momochi Akira (professor emeritus of Nihon University). With the return of the Abe administration presenting an ideal opportunity, Nippon Kaigi developed a “national movement” to amend the Constitution and campaigned to have local assemblies issue “position papers calling for early realization of constitutional revision.” The concrete realization of these efforts would become the Kokumin no Kai, an organization that I explain in detail below. Nippon Kaigi, since its establishment, has set up prefectural headquarters, and at present, it has an office in every prefecture. Moreover, from 2000, it started to establish local branches. This project did not proceed well at first. However, from 2006 and 2007, the organization put its efforts into establishing branches, aiming at 300 nationwide. It began that effort in order to counter the launching of 9-jō no Kai, the Article 9 Association, and the activities of that group across the country. The Article 9 Association was established in June 2004 by nine prominent people,12 and in response to their appeals, branches were established across the country in different localities and sectors. Membership in the Article 9 Association by 2006 surpassed 5,000 people. Through a series of lectures across the nation, the Article 9 Association, as well as the activities of related local or specialized groups, public opinion toward constitutional revision greatly changed. In a public opinion poll in 2004 by the Yomiuri Shimbun, 65 percent were found to approve amending the Constitution, while 22 percent disapproved. But by 2006, the same poll showed the approval rate to have dropped to 55 percent, while the disapproval rate rose to 32 percent. Then, in the 2007 poll, approval plummeted to 46.2 percent, with the disapproval rate rising to 39.1 percent, or around three times that of 2004. In 2007, the gap between approval and disapproval had narrowed to only seven points. (Currently, the approval and disapproval rates are about the same.) In order to compete with the Article 9 Association, Kokumin no Kai worked to establish local branches. At the end of September 2016, there were 250 branches (author’s survey), and those cities with more than 10 branches included Tokyo (19), Saitama (17), Kumamoto (17), Okayama (13), Aichi (12), Niigata (10), and Hiroshima (10). There were also prefectures, like Nagano (4), Shiga (4), and Tottori (4), where branches were few but still covered the entire prefecture. These prefectural headquarters and branches were linked to such organizations as the Nippon Kaigi Local Assembly Members’ League [Chihō Giren], the Japan Women’s Association, and the Japan Youth Council. In each locality they developed grassroots rightwing and constitutional revision movements. The main efforts of the movements were such activities as promoting the revision of the Constitution, adopting the school textbook published by Ikuhōsha by the Nihon Kyōiku Saisei Kikō [Japan Education Rebuilding Organization] and Kyōkasho Kaizen no Kai [the Textbook Improvement Association], as well as the one published by Jiyūsha of the Society for History Textbook Reform. Other activities included efforts to distort history by justifying Japan’s war of aggression and atrocities, and denying the system of military “comfort women” and the Nanjing Incident. They also included pressuring school boards of education to require schools to display the Hinomaru national flag and sing the Kimigayo national anthem. In addition, prefectural assemblies were pressured to display the flag, and in the schools, even homework and tests were monitored for content, leading to further pressure on school boards and schools themselves. In addition, there were activities to stir up nationalism over territorial issues. When we look at the share the league holds in prefectural assemblies, we find that they make up more than 70 percent in Yamaguchi, more than 60 percent in Yamagata, Ibaraki, and Ehime, more than 50 percent in Miyagi and Nagasaki, and over 40 percent in Akita, Gumma, Saitama, Chiba, Tokyo, Gifu, Shizuoka, Kyoto, Okayama, Fukuoka, Miyazaki, and Kagoshima. Such an unusual situation also prevails in 19 prefectures, where Nippon Kaigi has hijacked the assemblies with over 40 percent being members. Moreover, in city assemblies, 47.7 percent of the Osaka City assembly and 43.8 percent of the Yashiro City assembly in Kumamoto Prefecture are members. The Local Assembly Members League, by working through local assemblies, is developing such activities as promoting the adoption of textbooks published by Ikuhōsha and Jiyūsha, denouncing other textbooks, and organizing constitutional revision activities in the local area. Assembly members belonging to The Local Assembly Members League have blocked the adoption of history textbooks published by Jikkyō Shuppan during the process of selecting textbooks for high schools. Members have intervened with questions in the local assemblies, and they have pressured local school boards, aiming to block the adoption of this textbook. 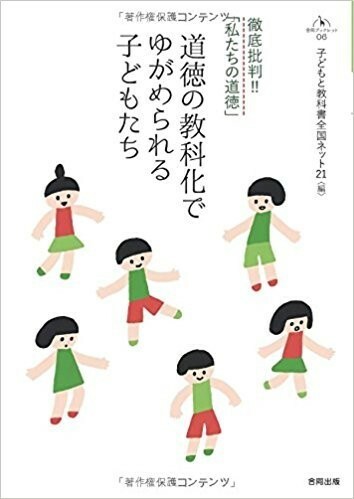 For example, in Saitama Prefecture, during the school textbook adoption process in 2013, the high school, as well as the Board of Education, chose the textbook published by Jikkyō Shuppan. To reverse this decision, the education committee of the prefectural assembly held two sessions when the assembly was in recess, and denounced the authors of the Jikkyō textbook, and summoned and examined the principals of the eight schools that adopted the Jikkyō textbook. The assembly then passed a resolution to reverse their choice. The Local Assembly Members League was behind this campaign. Similar cases of using the assembly to pressure for schoolbook choices occurred in Chiba Prefecture, Kanagawa Prefecture, Yokohama City, and Kawasaki City. In all cases, The Local Assembly Members League members organized the campaign. In Osaka, the campaign was led by the assembly members of Osaka Ishin no Kai [The Osaka Restoration Association]. Branches of Nippon Kaigi linked up with the Local Assembly Members League to promote their cause. In connection with history education and textbook adoption, the Nippon Kaigi and its related organizations (members and local branches) have begun to submit petitions and appeals to the local assembly, with the Local Assembly Members League members becoming facilitators, bringing up those issues in the assemblies, and making it easier for textbooks published by Ikuhōsha and Jiyūsha to be adopted. In 2014, the Abe administration revised the board-of-education system, making it easier for the heads of local government to intervene in the education system and textbook selection. Given this change, such organizations as the Japan Education Rebuilding Organization and the Society for History Textbook Reform, which have close ties to Nippon Kaigi, are calling on their local organizations, members and supporters to recruit assembly members who will cooperate in choosing textbooks during assembly sessions, as well as engage in joint activities to promote “education rebuilding.” In response to this, Nippon Kaigi developed activities to link up with other local assembly leagues and branches so that junior high school textbooks selected in 2015 would be those proposed by Ikuhōsha and Jiyūsha. On the issue of the Hinomaru national flag and Kimigayo national anthem, as well, maneuvers behind the scenes are linking local assembly leagues and local branches of Nippon Kaigi across the country. 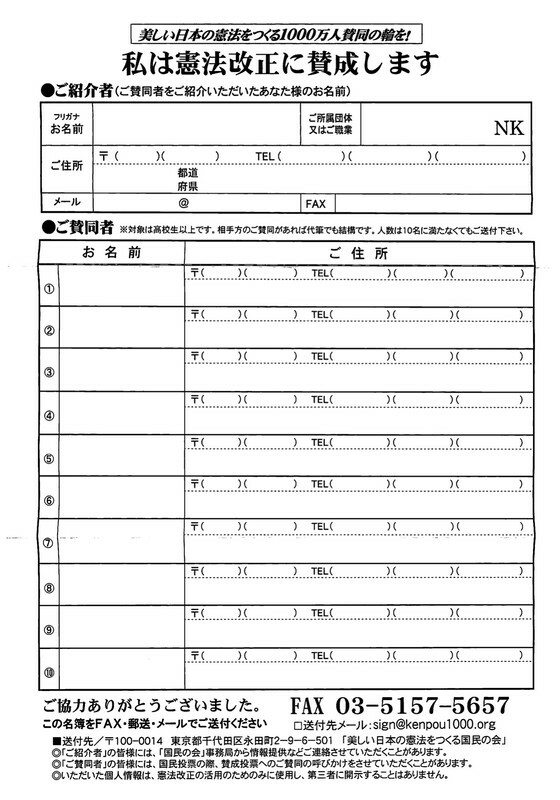 For example, a petition circulated by the local branch of Nippon Kaigi in 2013 in Nakano Ward in Tokyo called on all public elementary and middle schools to display the national flag daily. Three Ward assembly members belonging to the Local Assembly Members League introduced the petition and worked to persuade other assembly members to support it. Then, at a full session, the number of approvals and disapprovals was tied. However, with the approval of the assembly leader, the petition was adopted. A similar movement toward schools and petitions on the floor of local assemblies seeking to display the national flag was promoted by cooperation between both organizations. It is expected that such activities will be increased in the future. The task that Nippon Kaigi has put most of its efforts into has been the promotion of a grassroots campaign to revise the Constitution, a long-cherished goal that has united it with the Abe administration. The signatures to urge constitutional revision were not the work of limited number of shrines. The religious corporation Jinja Honchō, The Association of Shinto Shrines, reportedly encompasses 80,000 shrines nationwide who “aligned with the movement of the ‘National Association to Create a Beautiful Constitution for Japan (Kokumin no Kai),’ and promoted a signature campaign based on the actual situation in each shrine.” (Tokyo Shimbun, 1/23/2016) Based on a directive from the Association of Shinto Shrines, the prefectural shrine associations ordered shrines under their jurisdiction to collect signatures. Although the signature campaign was carried out by the Kokumin no Kai, it is an organization for constitutional revision established by Nippon Kaigi on October 1, 2014. On November 13, 2013, Nippon Kaigi held a convention of representatives from all over the country under the slogan “Bring about Constitutional Revision!” (800 participated, according to the sponsor). The body passed a resolution at the meeting calling for amending the Constitution within three years. Those attending the convention and giving speeches included Sakurai Yoshiko, who gave the keynote speech, Takaichi Sanae (then LDP Policy Affairs Research Chairperson), Hiranuma Takeo (Diet representative of the Japan Restoration Party [Nihon Ishin no Kai]), Matsubara Jin (Diet Steering Committee Chairman of the DPJ), Asao Keiichirō (Secretary General of Your Party), and Etō Seeichi (Prime Minister’s assistant). The meeting opened with such slogans as “Bring about a national referendum to amend the Constitution, one written by the people’s own hands!” and “Pass resolutions in all prefectural assemblies and 1,742 local assemblies demanding a national referendum!” Miyoshi Toru, then chairman of Nippon Kaigi, in his remarks as the representative of the convention’s sponsor, stated: “This convention aims to bring about constitutional revision through the powerful efforts of Nippon Kaigi.” In the written resolution of the convention, it was decided to “establish headquarters for amending the Constitution in all 300 election districts in order to attain half of the national referendum votes for amending the Constitution.” It also called for planning the formation of a grand national alliance to promote a national movement to approve constitutional revision (Nihon no Ibuki, January 2014). After a year of preparation, Kokumin no Kai emerged. It was described as a “national organization to develop at the grass-roots level a movement to promote amendment of the Constitution.” At the meeting to formally establish the organization, co-leader Sakurai Yoshiko gave a speech titled, “Breathe Life into Constitutional Revision!” It was followed by a speech by Hasegawa Michiko (professor emeritus of Saitama University and NHK board member), titled, “Conditions for an Independent State and Paragraph 2 of Article 9.” The co-leaders of Kokumin no Kai are key members of Nippon Kaigi: Takubo Tadae, chairman of the Nippon Kaigi (professor emeritus of Korin University), honorary chairman Miyoshi Tōru (former Supreme Court justice), and Sakurai Yoshiko. Listed as promoters were 40 well-known rightwing figures connected to Nippon Kaigi, and appointed as Kokumin no Kai members were 500 people representing various circles. These included The Association of Shinto Shrines’ President Tanaka Tsunekiyo, Hyakuta Naoki (Writer, Commentator and former member of the NHK Board), Hasegawa Michiko, Sugiyama Koichi (composer), Yayama Taro (critic, Representative director of the Association to Revise Textbooks, associated with the Ikuhosha Publishing Company). As explained above, Kokumin no Kai is conducting a campaign to collect collect 10 million signatures supporting constitutional revision. The signature form includes a space for writing in one’s name, address, and telephone number. If there is a national referendum, it is expected that 60 million would vote. The 10 million who signed their names would form the base for a predicted 30 million votes of approval. Displayed on the front of the signature form is a color photo of four children against the backdrop of Mt. Fuji, with the following slogans: “With your cooperation, we will reach 10 million signatures of approval to bring about constitutional revision”; and, “For a beautiful Japan, for our children.” On the back of the form, there is the name of the person who is introducing the supporter, as well as the names, addresses and telephone numbers of 10 supporters. There is also a leaflet, made up of three pages of A-4 sized sheets of paper. It has the same slogans as the signature form, and on the back is a message from Sakurai Yoshiko, titled, “Rainbow of Hope for a Beautiful Japan – People’s Power to Revise the Constitution.” The contents consist of seven statements that promote constitutional revision. The front and back pages of the signature form for the 10-million signature campaign by Kokumin no Kai. Promote a signature campaign among Diet members, as well as a resolution campaign among local assemblies, seeking early realization of constitutional revision. Establish “associations of prefectural residents” across all 47 prefectures, and promote an educational movement that will rouse public opinion to favor constitutional revision. Promote an expanded movement of 10 million supporters for creating a Constitution for abeautiful Japan. The organizations engaged in promoting Kokumin no Kai’s signature campaign and educating the public on the “constitutional revision” are the prefectural headquarters of Nippon Kaigi and local branches, the assembly members who belong to the Nippon Kaigi Local Assembly Members’ League, and the Japan Women’s Association. In order to carry out the activities of the Kokumin no Kai, Nippon Kaigi sponsored rallies in regional blocks (Hokkaido, Tohoku, Kanto, Hokuriku, Tokai, Kinki, Shikoku, Chugoku, and Kyushu), calling for early amendment of the Constitution. Block rallies, covering the entire country, continued until the end of December 2014 with lecturers including Kokumin no Kai coleaders Sakurai Yoshiko and Takubo Tadae. Following the rallies, Kokumin no Kai by November 3, 2015 had established the associations of prefectural residents in all 47 prefectures aiming at creating a constitution for a beautiful Japan. It also developed in each region street-corner campaigns and signature collecting activities. Further, it introduced a system of promoters to expand the number of supporters to 10 million. The roles of each promoter (organized in committees) were to: 1) make daily efforts to build public opinion in favor of amending the Constitution; 2) to expand the number of supporters by over 30 people; and 3) once the Diet to amend the Constitution was in session, to promote an expanded movement of supporters calling for Diet approval of a national referendum. In addition, contributions were solicited (minimum of 5,000 yen per person) for a “Constitutional Revision Movement Fund.” Such organizations as the Nippon Kaigi prefectural headquarters and branches, as well as the Japan Women’s Association, carried out the establishment of such organized activities and directed signature campaigns. The time is upon us to press the final switch. The LDP, since its founding, has flown the banner of Constitutional revision, but in 2003, when the LDP fell from power, its leaders proposed that the party should remove the plank about establishing an independent Constitution from its platform. At that time, 10 young LDP members, including the late Nakagawa Shōichi and Abe Shinzō, argued heatedly against that in a party leaders’ study group of about 30 lawmakers. As a result, during the debate, arguments were made that if the LDP were going to drop its efforts to amend the Constitution, they should dissolve the party. 10,000 Person Convention Held at Nippon Budōkan (Chiyoda Ku, Tokyo). On November 15, 2015, Kokumin no Kai held a “10,000 Person Convention at Nippon Budōkan: We Must Now Revise the Constitution!” From all over the country, 11,300 people (sponsor’s number) gathered for the rally. Prime Minister Abe, as LDP president, provided a video message shown on a giant screen on stage. At the convention, it was reported that the signature campaign to gather 10 million supporters for “creating a Constitution for a beautiful Japan” that Kokumin no Kai was promoting had reached 4,452,991 names, and that 417 members in the Diet from various parties had signed up as supporters (422 according to the website of the Nippon Kaigi Local Assembly Members’ League, that 31 prefectural assemblies had issued resolutions, and that the Kenmin no Kai (Prefectural Residents’ Association), which was collecting signatures, were established in all 47 prefectures. Local assembly resolutions as of October 2016 had been passed in 35 prefectures and in 51 city and town assemblies. Moreover, as of the end of October 2016, 7.54 million people had signed petitions, and the targets in 24 prefectures had been reached (Miyagi, Yamagata, Gumma, Chiba, Niigata, Toyama, Ishikawa, Gifu, Shizuoka, Aichi, Osaka, Hyogo, Nara, Wakayama, Okayama, Ehime, Kochi, Fukuoka, Saga, Nagasaki, Kumamoto, Aichi, Miyazaki, and Kagoshima). The Kokumin no Kai is showing all over the country a documentary film (DVD) on constitutional revision. It is titled, “The World Has Changed: How about Japan?” It was produced by Hyakuta Naoki, supervised by Sakurai Yoshiko and Momochi Akira, and narrated by actor Tsugawa Masahiko. Nippon Kaigi present the Constitution, education, and defense as one set of issues, which coincides with Prime Minister Abe’s own policy approach. The Abe administration, under the rubric of “Education Rebuilding”, has sought to overturn conventional education from its very foundation. It aims to thoroughly change the classroom environment and school textbooks based on the Fundamental Law of Education of 2006. It has sought to change the original goal of education from being for the sake of children to one of being for the sake of the state, national interests, and global corporate interests. The coming version of the Gakushu Shidō Yōryō [Education Guidelines] promotes Abe’s “education rebuilding” policy. The Abe administration has two policy aims: 1) economic policy (Abenomics), which seeks to make large companies more competitive so that they can succeed in the global market; and 2) amending Article 9 of the Constitution to make Japan into a “war-waging” country. For that second policy goal, he rammed security legislation through the Diet in September 2015 (war laws) in violation of Article 9 of the Constitution. The Abe administration’s “education rebuilding” policy was realized with the passage of the revised Fundamental Law of Education in 2006. The policy aims to create “human resources” (jinzai) to carry out the goals of the new law. Abe’s “education rebuilding” policy aims at 1) the cultivation of human resources sought by large corporations seeking to win in global competition; and 2) education that will produce a “national army” and supporters of the same. In both aims for human resources education, there must be inculcated in the schools a sense of “patriotism” and “morality,” and in order to realize these aims, the system of education and type of textbook are essential. The Abe administration stresses that “education rebuilding is the foundation for realizing a society in which there is “dynamic engagement of all 100 million citizens” [ichioku sōkatsuyaku]. As we have seen, Nippon Kaigi is Japan’s largest far right organization and a powerful citizens’ body supporting the Abe administration. 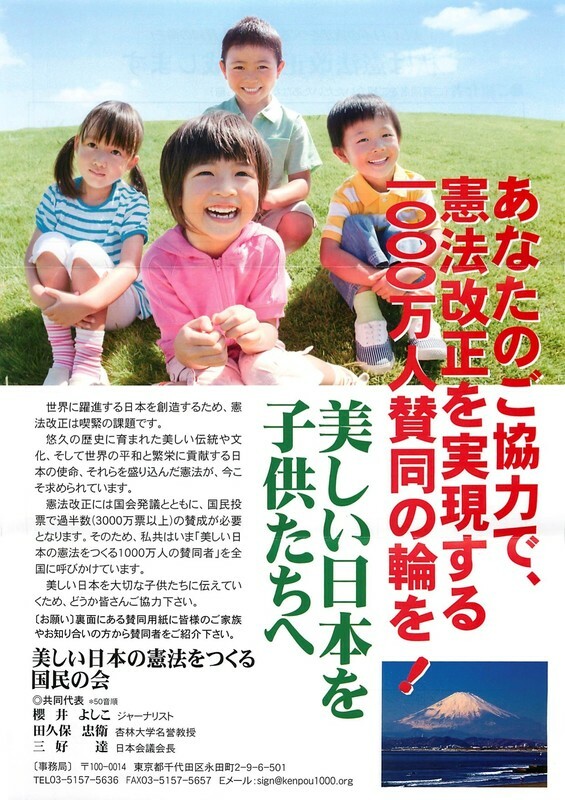 Nippon Kaigi and Nippon Kaigi Diet Members League have strengthened their links and are promoting through a “grassroots rightwing movement” centered on such organizations as Kokumin no Kai, which is a front organization of Nippon Kaigi, the Constitutional revision advocated by the Abe administration, to result in the creation of a “war-waging” country. The importance of the Nippon Kaigi Diet Members League, which penetrated the first, second, and third Abe cabinets, has grown greater than that in any other cabinet. The second cabinet reshuffle of Abe’s third term, has resulted in 16 out of 20 ministers (80 percent) being members of the Nippon Kaigi Diet Members League. Three of the prime minister’s assistants and two of his deputy chief cabinet secretaries are members of the Nippon Kaigi Diet Members League. It might be said that the Cabinet has been hijacked by Nippon Kaigi, and that it has taken political control over Japan. It is critical to inform the Japanese people about the actual state and nature of this organization and its Diet Members League. I think that this is also the role of the media, as well as peace groups and civic groups. Tawara Yoshifumi is the Executive Secretary of Children and Textbooks Network Japan 21. He is a pioneer following the activities of Nippon Kaigi and related organizations, as well as the issues surrounding textbooks and education. He has published numerous books and articles on the topic, including a book on Nippon Kaigi last year, entitled Nippon Kaigi no Zenbō! : Shirarezaru Kyodai Soshiki no Jittai[The Full Picture of Nippon Kaigi! : The Reality of the Uknown Large Organization] (Kadensha 2016). Tomomi Yamaguchi is an associate professor of Anthropology at Montana State University. She is a co-author (with Nogawa Motokazu, Tessa Morris-Suzuki and Emi Koyama) of Umi wo Wataru Ianfu Mondai: Uha no Rekishisen wo Tou [The “Comfort Woman” Issue Goes Overseas: Questioning the Right-wing “History Wars”], Iwanami Shoten, 2016, and contributed a chapter in Shūkan Kin’yōbi, Narusawa Mueno ed., Nippon Kaigi to Jinja Honchō [Nippon Kaigi and the Association of Shintō Shrines](Kinyobi 2016). She is also an author of “Press Freedom under Fire: “Comfort women,” the Asahi Affair and Uemura Takashi” in Jeff Kingston ed., Press Freedom in Contemporary Japan, Routledge, 2017. 1Original Japanese article published in the December 2016 issue of the monthly magazine Peace Movement [Heiwa Undō]. 2At least eight books that include Nippon Kaigi in their titles were published in 2016-7, in addition to special issues of magazines and newspapers. 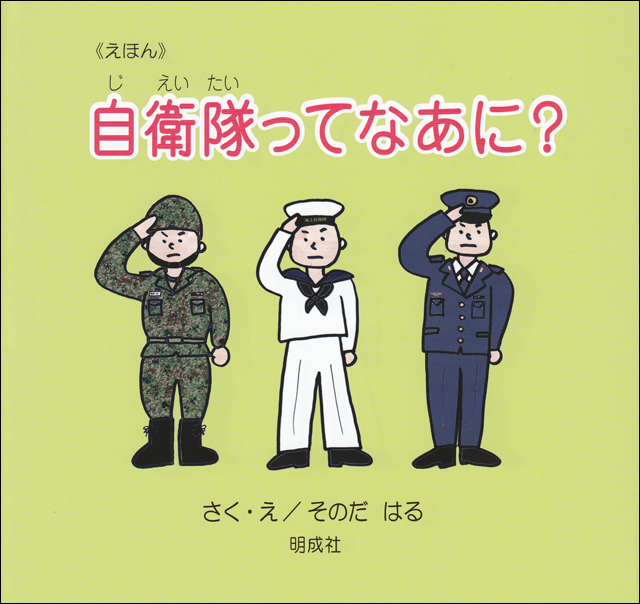 3See Tawara Yoshifumi, “Kyōiku Shuppan Shōgakkō Dōtoku Kyōkasho Mondai ni Tsuite” (About the Problem of Moral Education Textbook for Elementary School Students by Kyōiku Shuppan). 4See Carl Goodman, “The Threat to Japanese Democracy: The LDP Plan for Constitutional Revision to Introduce Emergency Plans” on the danger of an emergency clause. As for the LDP proposal to introduce a family protection clause as part of Article 24, the proposed language makes the family, not the individual, the basic unit of the society, and requires family members to help each other (which could lead to decreased governmental assistance for struggling families, childcare and elderly care.) See “Nippon Kaigi calls for Constitution to define family, cites ‘sazae-san’as Japan ideal.” The Mainichi, November 3, 2016. 5Nippon Kaigi’s book sales website. 6Aoki Osamu, “Koike Yuriko shi, Nippon Kaigi honryū kara hazureta aikokusha.” [Ms. Koike Yuriko, a patriot who is off from the mainstream Nippon Kaigi.] AERA, November 14, 2016. 7“Koike says no to eulogy for Koreans killed in 1923 quake.” The Asahi Shimbun, August 24, 2017. 8The requirement for the use of reign era names, instead of the Western calendar years, would signify that it goes back to prewar practice, and its association with the imperial reign is particularly problematic, especially when it is required by law. 9The word, “yokusan,” used by Tawara here to explain these rightwing organization is used in the case of the pre-war Taisei Yokusan Kai, the Imperial Rule Assistance Organization. 10As of September 2017, the organization’s chairman is Nishioka Tsutomu, and Takahashi Shirō is the vice chairman. 11Currently the organization has no chairperson. All images are from The Asia-Pacific Journal: Japan Focus.